As “Keep It In the Ground” activists attempt to stymie energy growth and production in New Mexico’s neighbor to the north, this new analysis highlights how the energy revolution helps to revitalize communities and contribute to local job growth and economic investment. According to the report, New Mexico’s oil and gas industry provides more than 100,000 jobs statewide, employing one in every eight New Mexicans. The industry is also filling New Mexico’s state coffers, helping to fund municipal services and environmental improvements. According to the report, the oil and gas industry provides New Mexico $2 billion annually in severance and property taxes, royalties from production on state and federal lands, and rental income. Sales and income taxes on oil and gas drilling and service activity generate an additional $300 million for the state. These positive trends continue to grow. In August, the New Mexico Consensus Revenue Estimating Group released a report estimating that revenues for the fiscal year that began July 1 will outpace spending obligations by $1.2 billion, about 15 percent more than what was expected. This revenue influx is largely attributable to booming oil production in New Mexico’s share of the Permian Basin, which has vaulted the Land of Enchantment to become the country’s third-largest oil producing state. This continued growth will continue to fill state coffers and fund public education across the state. 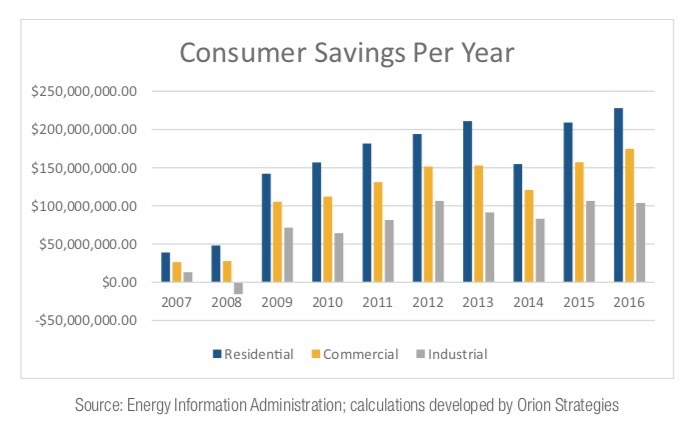 This most recent CEA analysis comes on the heels of a number of similar previous reports from the organization finding total savings of more than $152 billion from 2006 to 2016. The CEA recently reported that Appalachian Basin states of Ohio, Pennsylvania and West Virginia saved more than $80 billion combined during this time period. CEA also found that Colorado and Texas consumers saved nearly $12.4 billion and $60 billion, respectively, over the decade. These remarkable figures are an important reminder that record U.S. oil and natural gas production mean much more than improved bottom lines for producers. The shale revolution is not only fueling our economy, but is providing savings to families and businesses, support for public education, and a wealth of job opportunities for those living in resource abundant states.